“Proceeding in a convoluted fashion,” what an exciting way to learn about that section of the city! 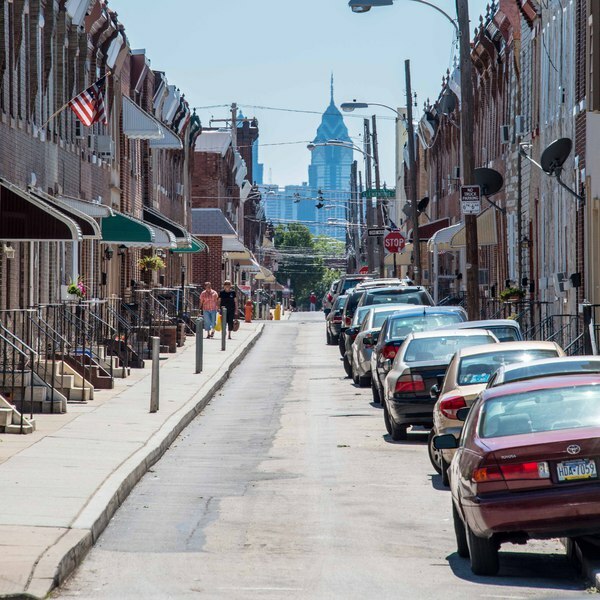 Port Richmond lies about a mile north of center city Philadelphia between the neighborhoods of Fishtown and Bridesboro. Along with Kensington and Olde Richmond, these towns are collectively known as the River Wards as the Delaware River flows along their eastern borders. 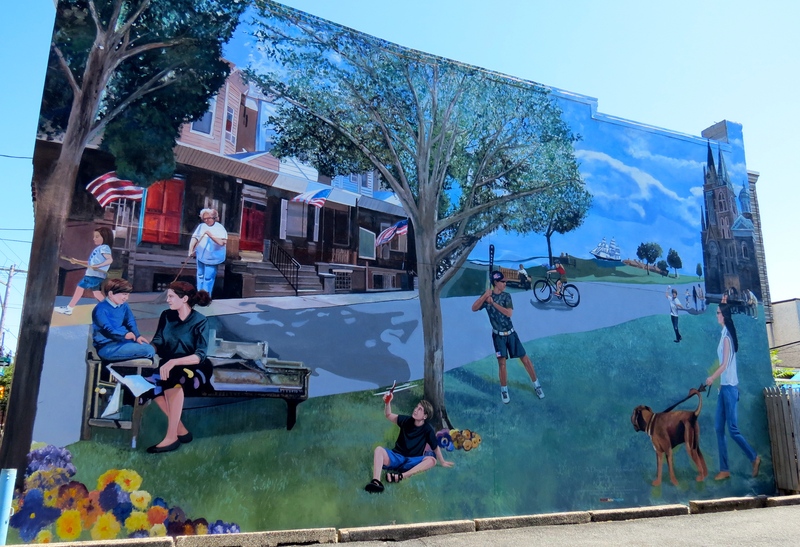 As we strolled through the neighborhoods, we came across this mural, which embodies iconic Americana images: flag, dog walking, baseball, church, children on bicycles, scenes we viewed as we wandered through the lanes of the city. My eye was drawn to the image of a clipper ship in the left corner because of my fondness for sailing vessels. Just south of Lehigh Avenue, Cramps & Sons opened a shipbuilding business in 1830 and was still operating 70 years later. 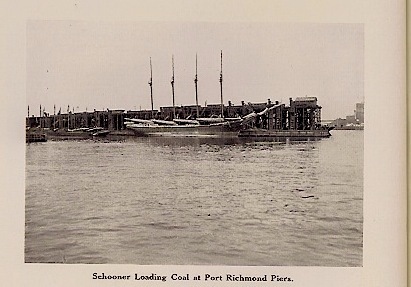 In the 1850s the shipyard built clipper ships and later transitioned to steam-driven ships of the 1870s. In May of 2015 Port Richmond made international news for the fatal derailment of an Amtrak train. In 1942 another train derailment on the curved section of tracks killed 79 and injured 117. In April of 2014 a minor train derailment of cars carrying acetone caused a major traffic jam. On the following day, protesters marched outside of Philadelphia Energy Systems demanding safety checks that would protect the community. For residents, stories of train derailment and leaky tank cars tell an important part of the history of the area. Train tracks cut right through the center of this neighborhood. Huge embankments support the tracks. Tunnels that connect the two sides of the town are longer than several football fields. We entered one of the dark underpasses, which felt like a “no man’s land” of steel and concrete. Trash littered the sidewalk and street. The remains of a television set were scattered over the curb, as if someone had tossed it from a vehicle. Most of us took pictures of the shattered TV, but I’m not sure why. On the other side of the underpass, I climbed up one of the embankments for a picture of the black tank cars coupled together. I was lucky to hitch a ride to our destination with fellow photographer Annette. From Route 95, we got off at Exit 23 after City Hall. We drove down the main thoroughfare, Lehigh Avenue, only to be perplexed by the parking situation. On the right side of the road, the parking slots were angled in the opposite direction! We had to circle around a second time before we noticed the sign that read: Back into the parking spots. We found our leader, Mike Klusek, and fellow photographers at the Green Rock Tavern, a small neighborhood corner pub that has retained the original bar counter and tin ceiling. Bottles of spirits were shelved in mirrored cabinets. A chalkboard listed the menu items for the day, and regulars sat on the stools, conversing with the bartender. Cameras ready, we strolled down the wide sidewalk to the PortSide Art Center, decorated in a brightly-colored underwater sea motif with fish and other creatures created from glass. We walked under the Lehigh Viaduct and along the working class neighborhoods of neatly kept row houses, some with marble steps. Each home reflected their owner’s preferences for patriotic fervor, political statements or just flower boxes. Flowers and hedges filled the back yard landscapes. Irish and Polish taverns and eateries stood on corner locations, and grand churches occupied center blocks. Folks were friendly toward our band of photographers, sometimes approaching us with questions or comments, and were agreeable to being snapped in a photograph. When immigration was at its peak in Philadelphia at the turn of the 20th century, Polish people settled in Port Richmond. They built Saint Adalbert Church that reflects the Polish Cathedral architecture, heavy in ornamentation from the Renaissance and Baroque eras. 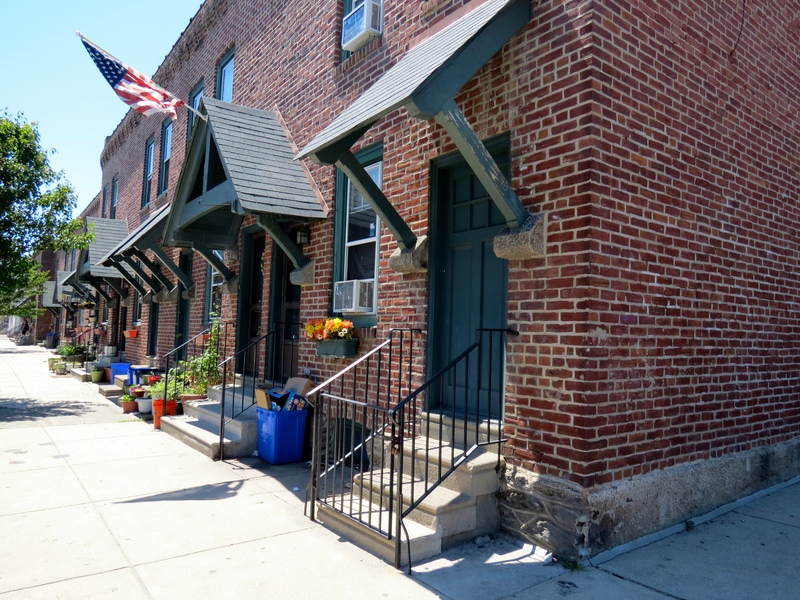 Immigrants from Poland continue to make this neighborhood their home. We stopped in a Polish grocery store, and I bought Chruschiki, traditional, fried cookies. A number of restaurants and stores in the area of Allegheny Avenue cater to the Polish-American community. The Krakus Market on Richmond Street offers a large choice of Polish foods, including a variety of kielbasy, Polish newspapers and pastries. I bought several bottles of mustard made in Poland. Lithuanians, who have historically been linked with the Polish nation, hold their festivals and dances as well as catered affairs for the community, at the Lithuanian Dance Hall, now the home of the Theatre Company of Port Richmond, a community theater company. 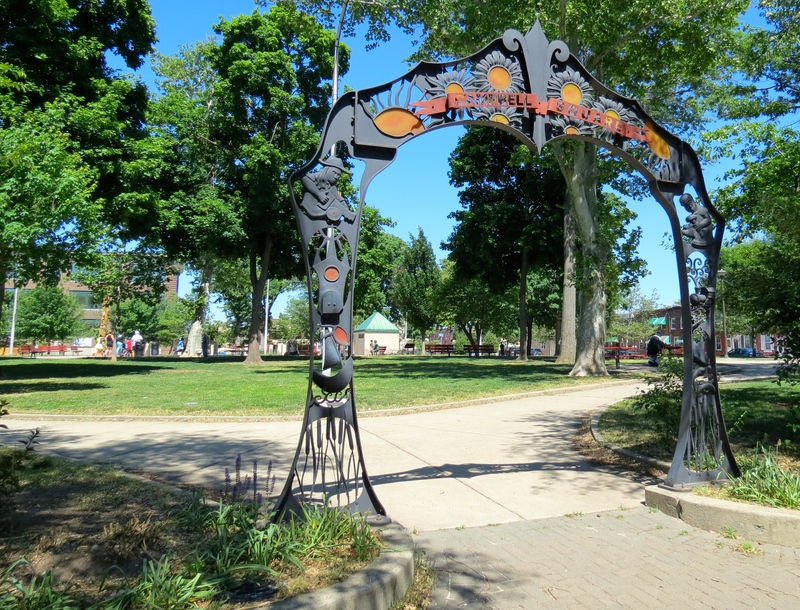 An ornate wrought iron archway decorated the entrance to Campbell’s Square, a shady park where children played ball and folks walked their dogs. Special community events take place in the plaza, and Polish American String Band, award-winner in the annual Mummers Day Parade, holds regular concerts for the residents. The community is proud of their park and have created a Facebook page, announcing how volunteers can participate in cleanups and garden work, a true measure of the commitment to their neighborhood. We stopped in Port Richmond Books, which houses a 200,000 collection of books, newspapers, magazines and records. The store occupies a century-old former movie theater. They have renovated the façade but it is still possible to see the original footprint of the theater. After our walk, we returned to the Green Rock Tavern for dinner: home-made potato and cheese pierogi with a side of sauerkraut, delicious especially after a long walk! 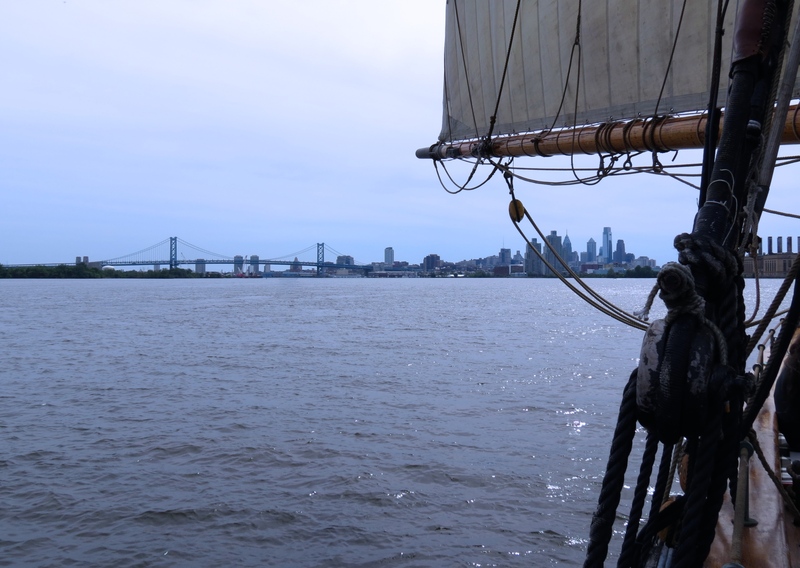 I hope to visit to Port Richmond again, to sample more of the home-cooked Polish food and to explore along the Delaware river, especially the Port Richmond trail. Skyline of Philadelphia peeks over Port Richmond. Photo credit: Annette Newman, a.new.photos. Many thanks to Mike for his informative history of the area and photographic suggestions. Interesting scenes and pictures. The mural looks really awesome. That many accounts of accidents I think ultimately it’s the company’s fault, but gotta do with other people in positions as well. Seems like I need to meander with a photographer. Philadelphia has the world’s largest outdoor art gallery, amazing murals. I’ve come across them in surprising locations. Thanks for commenting.